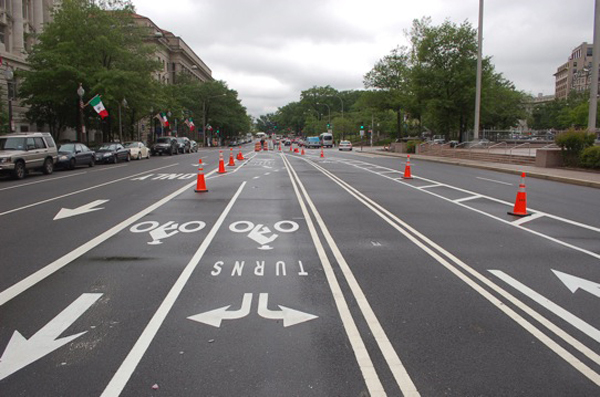 On a visit to Washington D.C. in June, Hans took these photos of the new bike lane installed in the middle of Pennsylvania Avenue between the White House and the Capitol Building. 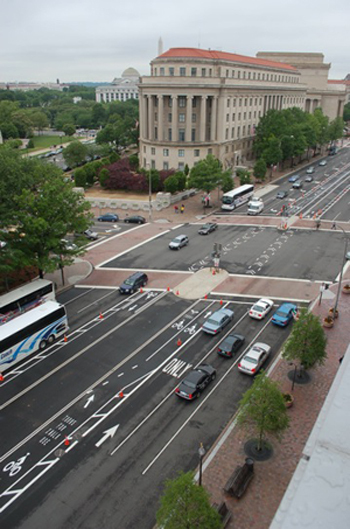 The Washington Post explained that the bike lanes were put in the middle of the street to avoid conflicts with right-turning vehicles, parked cars and vehicles entering the road from driveways. Cyclists access the lanes at crosswalks. There was, not surprisingly, some controversy about the lanes and the city actually narrowed them days before they opened. I like them for the statement they make: bikes just aren’t something to literally be shoved off to the side of the road.